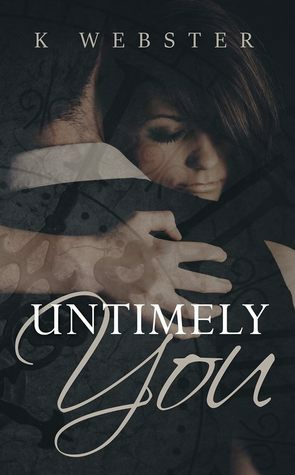 K Webster delivers an extremely intense and emotional read with Untimely You. I must admit I was blindsided, this was one of those books I went into blind. While it wasn’t what I was expecting it was none the less heart breaking and extremely thought provoking. What would I do in this scenario? To be honest, I do not have a clue. This story pulled out every single emotion. While the story was unconventional and certainly a surprise it brought me to tears for so many reasons. Tears for Adrian and tears for Nessy and tears just in general for the situation that they found themselves in. Adrian at first glance was aloof, professional and untouchable. He was a boss that Nessy only saw while he tore through the office like a whirlwind on his way to his own office on a daily basis. She couldn’t deny he was an enigma…a handsome enigma but still, she felt like he had the weight on the world on his shoulders, he always seemed troubled, detached, but she needed to keep things professional, she needed this job. Neely was a free spirit and a complete and utter book nerd (we should be BBF’s). Her demeanour was infectious, she was clumsy, compassionate, she had no filter and she had the hugest heart of gold. Nessy’s dreams consist of owning her own publishing house and the bank will not lend her the money until she has a years’ worth of employment under her belt. While this job is beneath her, it was a means to an end and an end that she was determined to get to. Adrian hadn’t always been this way, twelve years ago his life changed and now it was just he and his son. Even though his son is now nineteen his life revolves him and around work, he has no time for anything else and no inclination to do anything either, or anyone. In a self-imposed life of loneliness for over a decade Adrian hadn’t banked on Emmy and she was the last distraction he needed…or did he? This book at times was emotionally frustrating and I cannot even say why because it is a huge spoiler. But this is where K Webster really brought her characters into your heart and head. You empathised, you sympathised and your heart hurt. K Webster nailed the character connection, as much as Adrian was hard to love in the beginning once you get his full back story everything becomes apparent and suddenly nothing is as it seems. Nothing is black and white but a very murky shade of grey. The situation they find themselves in is tenuous at best, but will the first woman to snag Adrian’s attention in twelve years have what it takes to guide them through their minefield to the light that you constantly hope is at the end of the tunnel? I shed a lot of tears, my heart ached, I was frustrated, I was angry, I swooned but most of all I had hope. Hope that the past could finally be put to rest and that the future was warm and welcoming. A very unique situation that the author delivered with believability and a huge dose of compassion. A great story.